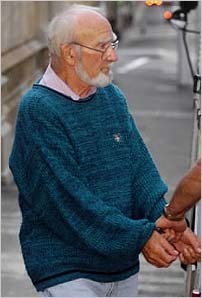 A Supreme Court judge has blamed Australia's most widely used antidepressant for causing a 76-year-old man to kill his wife of 50 years. Justice Barry O'Keefe said David John Hawkins strangled his wife, Margaret, as a result of taking 250mg of Zoloft - five times the recommended dose. "The killing was totally out of character for the prisoner, inconsistent with the loving, caring relationship which existed between him and his wife, and with their happy marriage of 50 years," Justice O'Keefe said. "I am satisfied that but for the Zoloft he had taken, he would not have strangled his wife." Hawkins, a retired mechanic from Tumbarumba, in southern NSW, pleaded guilty to manslaughter on the grounds of diminished responsibility. In sentencing him to a minimum two years' jail, Justice O'Keefe said Hawkins was genuinely remorseful for killing his "soulmate" and was unlikely to reoffend. The chairman of the national drug initiative, beyondblue, Professor Ian Hickie, said: "Generally speaking, [Zoloft] is extremely safe ... but, like all drugs that work, in some situations they are associated with unusual reactions." "I was looking at my wife but I wasn't seeing her face," he told a doctor. Hawkins then attempted to kill himself. Dr Bill Ketelbey said: "It is pure speculation that aggression is a side effect. "In a few instances where patients have inadvertently taken an overdose [of medication], there has been a very wide margin of side effects." Pfizer lists more than 30 possible side effects in boxes of Zoloft, including agitation, anxiety, nervousness, abnormal thinking, lack of feeling, vomiting and twitching. Her brother launched legal action against Pfizer Inc and a psychiatrist, claiming she was under the influence of Zoloft. A civil action lawyer, Mr Peter Semmler, QC, said that while it was "theoretically" possible for a drug manufacturer to be sued if one of its products was shown to have caused homicidal behaviour, it would have to be proved that the company had failed to take reasonable care in the manufacture of the drug or in giving adequate instructions or warnings. Professor Hickie said the community needed to be better informed about depression and the drugs used to treat the illness. "We need to make sure that doctors and pharmacists provide adequate information and in forms that people can understand. "That traditionally has not been the case," he said. An Australian Medical Association psychiatrist, Dr Bill Pring, said there was no reason to ban Zoloft. If used early and effectively, it could prevent violent behaviour, he said. A spokeswoman for the Therapeutic Goods Administration said it would review evidence linking Zoloft to Hawkins's violent behaviour. It would consult national drug regulatory agencies and Pfizer about whether they were aware of other reports attributing serious criminal behaviour to Zoloft.